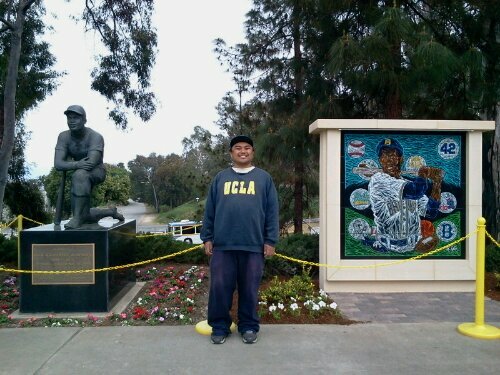 This statue and mural of Jackie Robinson are located along the first base concourse over at Jackie Robinson Stadium where the UCLA baseball team plays it’s home games. 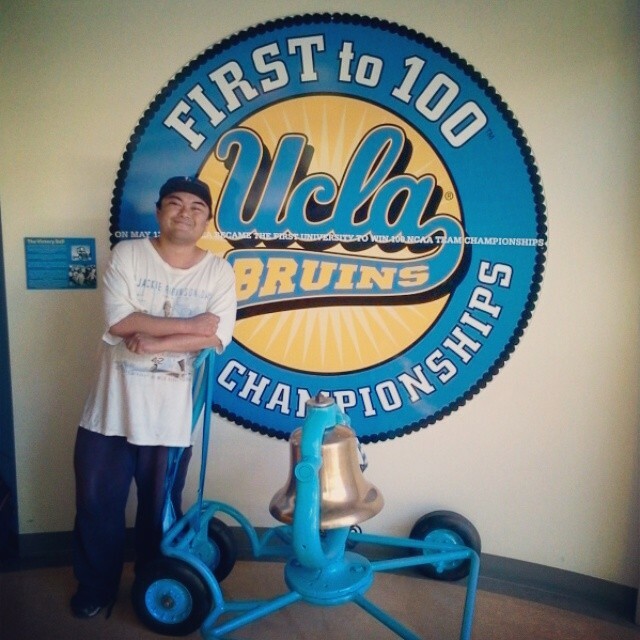 In the spirit of Rivalry Week, Drei here now brings you his Fave 5 USC-UCLA games attended over the years…. One year removed from the 50-0 debacle at The Coliseum, with 1st year coach Jim Mora taking over the head coaching reigns and redshirt QB phenom Brett Hundly under center, the Bruins would storm out to a quick 24-0 lead in the 1st half. SC would later close the gap to 3 points in the 4th quarter, however, the Bruins would counter on a Jonathan Franklin touchdown run late in the 4th and a huge sack of Matt Barkley from Anthony Barr would seal the deal for The Sons of Westwood. 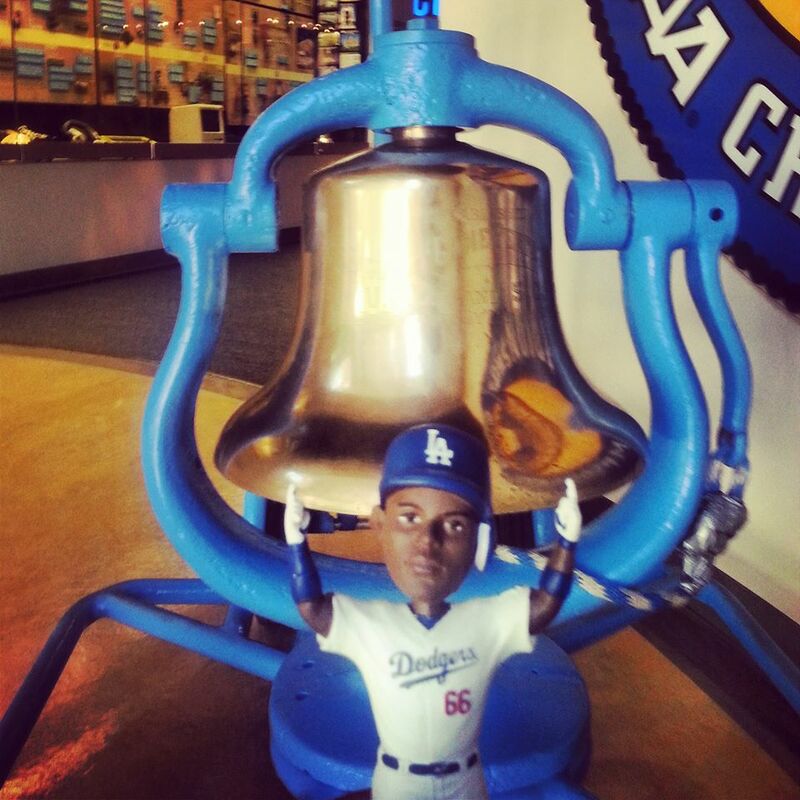 Prior to this game, SC had won 11 of 12 in this series. UCLA has now won the last two, with Hundley sporting a perfect 2-0 record against the Spirit of Troy. 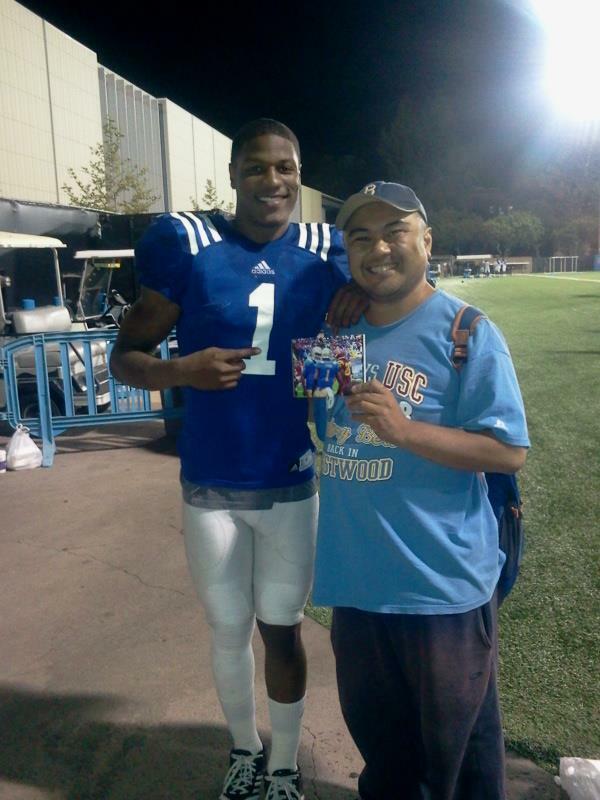 Shaq Evans and I proudly displaying my pic of him and Hundly celebrating. Shaq is currently in the IR with the New York Jets. A USC win would not only put USC back in the National Title game for the 3rd straight season, but also tie the rivalry record for most consecutive wins by either school at 8. With USC driving for a possible game winning touchdown late in the 4th quarter, Eric McNeal picks off a John David Booty pass deep in UCLA territory. The interception would be huge as UCLA would prevent USC from playing in the National Championship game as well as preserve the longest winning streak in the series at 8. With a Pac-10 title and a Rose Bowl berth on the line for both schools, UCLA would race out to a 17-0 lead, a lead they would carry into halftime. However, USC would mount a comeback and late in the 4th quarter USC QB Rob Johnson would drive his team all the way to the UCLA 2 inside a minute to play, trailing UCLA 27-21. But on 3rd and Goal, Marvin Goodwin stepped in front of SC tight end Tyler Cashman to intercept what may have been the game winning TD for USC. The win not only sent UCLA to it’s first Rose Bowl in 8 years, but also ended a streak of 10 games which USC had won with a Rose Bowl berth on the line. 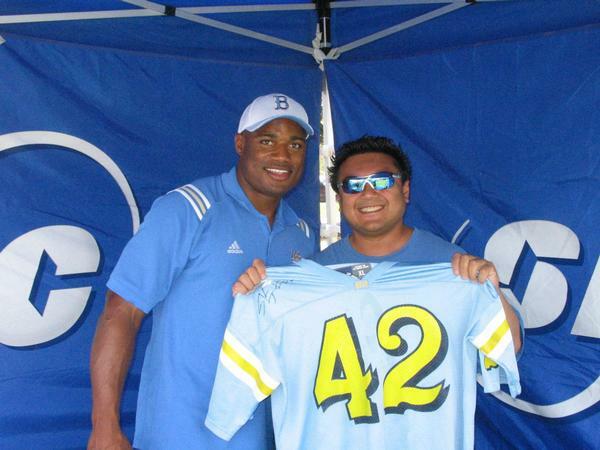 Due to a string of injuries to UCLA QB’s, John Barnes, who did not even have a spot on the spring roster, John Barnes, a walk-on only because his previous school UC Santa Barbara, dropped their football program, would be called upon to guide the Bruins in the biggest game of the season. A tall task to ask of a 6th string QB huh ? 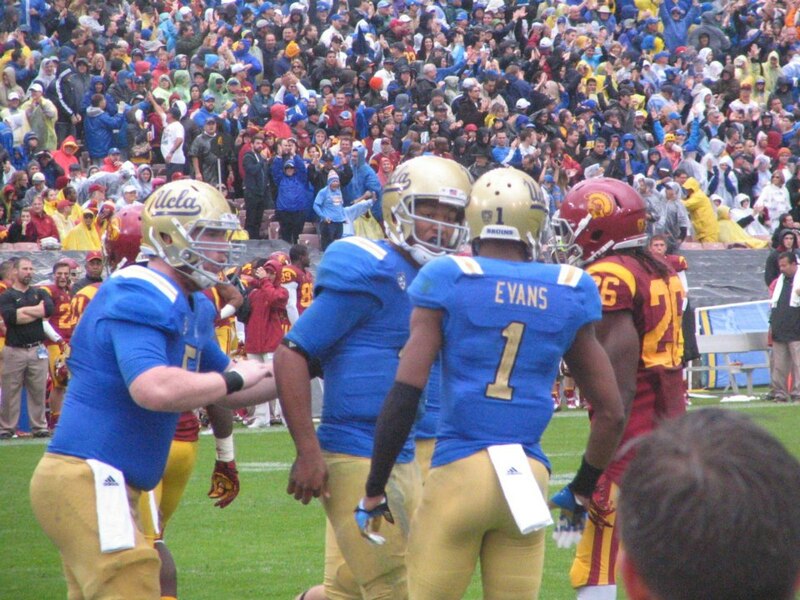 It seemed that way heading into the 4th quarter with UCLA trailing 31-17. Ah, but this is where the legend of John Barnes was born. 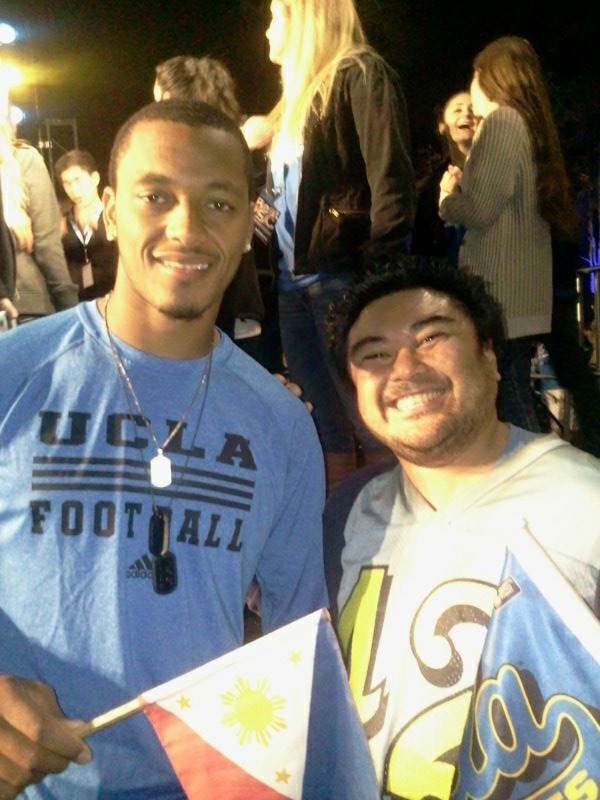 UCLA would score 3 TD’s in the 4th quarter, two of them to J.J. Stokes, who would have a huge 4th quarter himself and etch his name into the hearts of every Bruin fan as well. The 3rd of the 3 4th quarter TD’s would be a 90 hookup, Barnes to Stokes ( Still a popular phrase among the Bruin faithful who witnessed that magical evening in ’92… Barnes to Stokes ) to give UCLA a 38-31 lead. SC would not go away as Rob Johnson would hookup with Johnny Morton on a huge 4th down conversion inside the UCLA 10 with less than a minute to play. 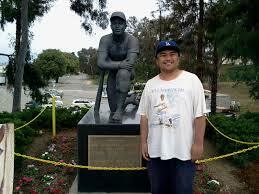 2 years prior, Johnny Morton would break the hearts of UCLA fans and nearly pulled off the same feat. However, after a Rob Johnson TD, SC would decide to go for 2 rather than tie ( No OT in college football at the time ), and Rob Johnson’s pass would be knocked down by Nkosi Littleton, and UCLA would go on to upset SC 38-37. John Barnes would finish with 385 passing yards, and J.J. Stokes would finish with 6 catches, 263 yards receiving and 3 TD’s, including the game winning 90 yarder which many a Bruin looks back upon with these words… Barnes to Stokes . It was the first season of the post Terry Donahue era. UCLA came into this matchup with a mediocre at best 4-6 mark. SC, who had high expectations heading into the season, was no better at 5-5. 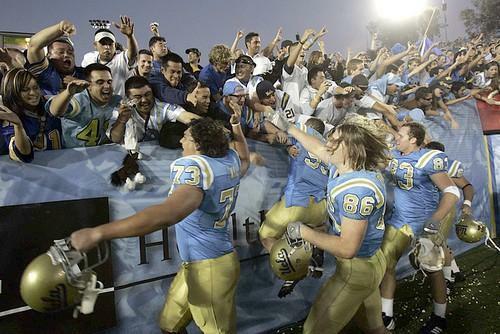 UCLA had carried a 5 year winning streak heading into this contest, the longest streak in the rivalry at that time. USC would storm to a 24-7 halftime lead, thanks in large part to 2 TD passes from Brad Otton to USC freshman phenom R.J. Soward. Soward would finish the game with 6 recptions, 3 TD’s and 260 yards receiving, virtually the same stats J.J. Stokes had 3 years prior. The second half would be the most thrilling half I would ever have as a UCLA fan. It would also be an emotional roller coaster ride as well. The second half would start out strong for UCLA as UCLA QB sensation Cade McNown would connect with Danny Farmer on a long TD pass to close the gap to 24-14. However, SC would answer back on a long drive of it’s own, brining the lead back up to 17. So on UCLA’s next possesion, after converting 3 huge 3rd down conversions, one of them a 3rd and 21, Cade McNown rushes for a TD to close the gap back to 10 heading into the 4th quarter. After both teams exchanged punts, with Matt Koffler now replacing an injured Brad Otton at QB for USC, Koffler would connect with R.J. Soward on a quick TD strike, giving SC what seemed to be an insurmountable 17 point lead . That would be RJ Soward’s third TD reception of the game, 2 of them in which he would score in the NE corner of the endzone, yup, right in front of me. In addition, SC safety Sammy Knight would also have a pick 6 finish, that’s right, in the NE corner of the enzone, uh-huh, right in front of me. I was really having a great day to that point, wasn’t I ? 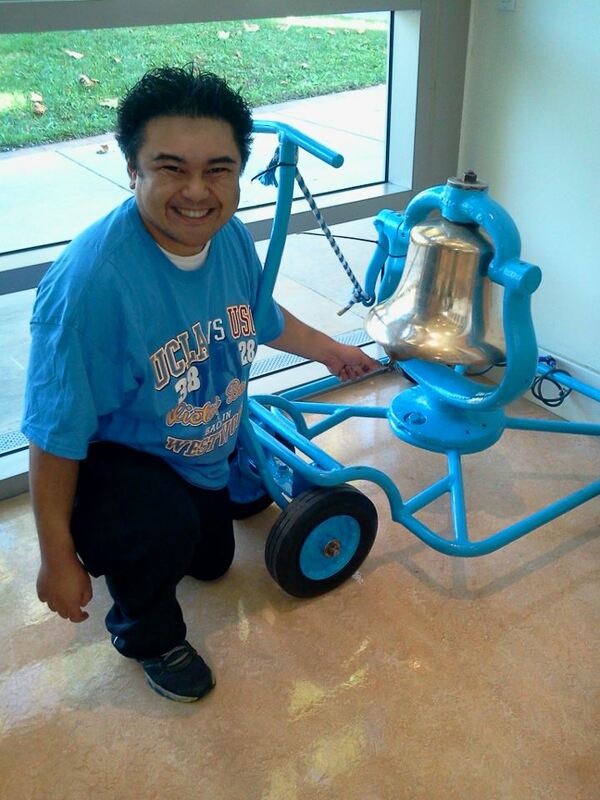 Did I say a miracle would save UCLA ? On a 2nd down run, SC running back LaValle Woods would have the ball stripped from him and Kusanti Abdul-Salam would recover for UCLA. Here was UCLA’s chance. 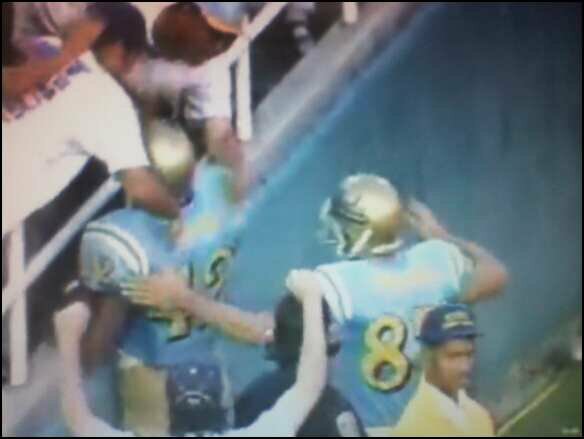 One play after a huge 3rd down conversion from Cade McNown to little used Rodney Lee, UCLA running back Skip Hicks would bust up the middel 11 yards for the game tying score. SC would have one last shot to win the game in regulation after a huge 3rd down reception by Chris Miller at the UCLA 23. However, Adam Abram’s attempt at a 41 yard game winner would be blocked, and for the first and only time in the history of USC-UCLA, it was on to overtime. SC was not finished. On their next possesion, on 3rd and 3, Brad Otton would spot RJ Soward wide open after picking up UCLA’s blitz. Soward had nothing but grass ahead of him. Where would his potential game tying TD finish ? Yup, right there in the NE corner of the endzone, right in front of me. But it was not meant to be, as he would drop a sure TD and on 4th down, Koffler’s desperation pass would be intercepted in the endzone, and UCLA would win it’s 6th in a row over USC. The streak would eventually reach 8, still the longest in the series. Both schools come into the game with momentum on their sides. UCLA come’s in with still a shot at the PAC-12 South title. 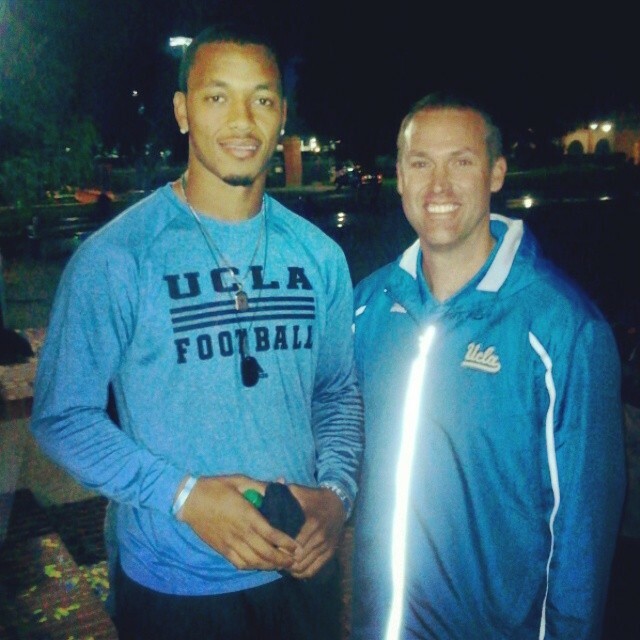 The key for UCLA to win once again will be Brett Hundley, as also acknowledged by USC. SC’s defense has been known to wittle down in the 2nd half, and in the previous 2 meetings between these schools, Hundley’s mobility has proved to be SC’s achilles heel. If UCLA can maintain that and keep SC’s defense chasing their running game, particularly in the 1st half, that can play huge later in the game. Let’s make it 3 in a row over SC Brett !! !